Well, Spring has definately sprung here in Antalya and the flowers and birds are not the only ones who are full of energy as the work on Möbius within the Naval Yachts shipyard continues to blossom and bloom. 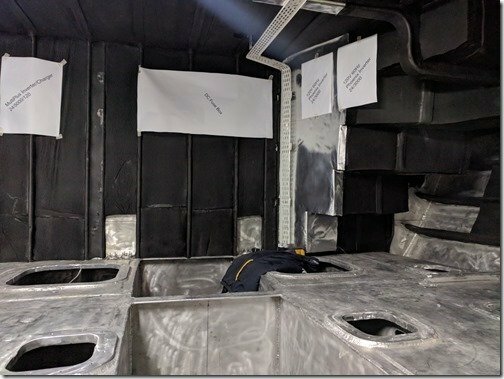 Progress continued on building the new hatches you saw started last week as did work on the aluminium pipe railings and the installation of trays for wire and hose runs. Let’s go check it out. Picking up where we left off last week here are five of the ten new hatches we’ve designed all assembled and ready for the final TIG welding of the inner frames to the Gutter frame. 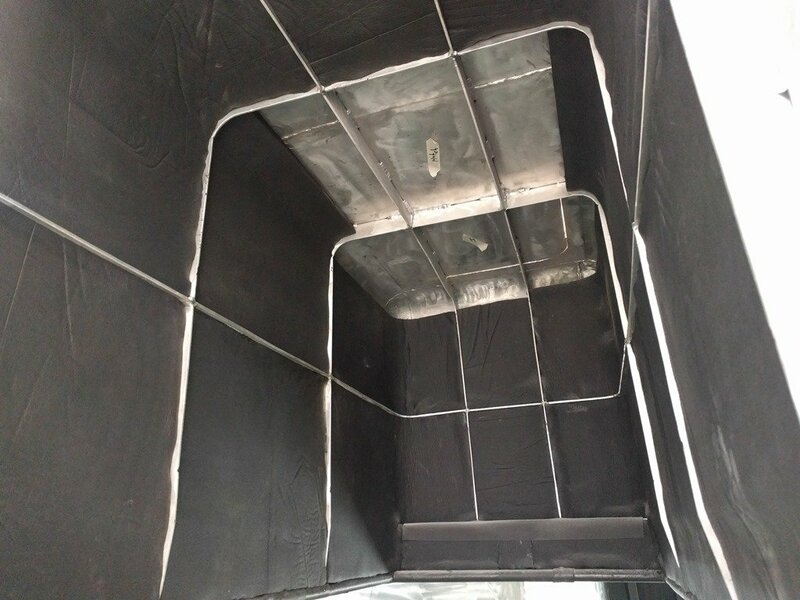 These hatches are sitting upside down from how they will be installed and you can see the finished TIG welding around the corner where the outer frame attaches to the Gutter frame. 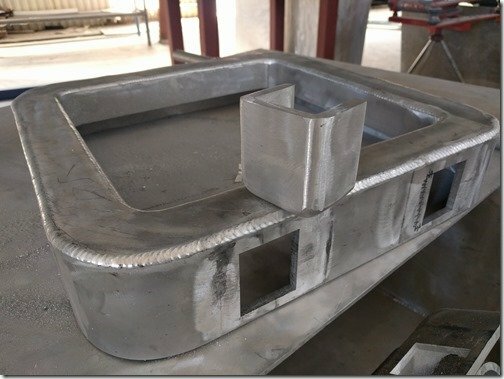 Here you can see the different stages of welding the three individual 8mm thick plate parts which make up the Frame of the hatches. 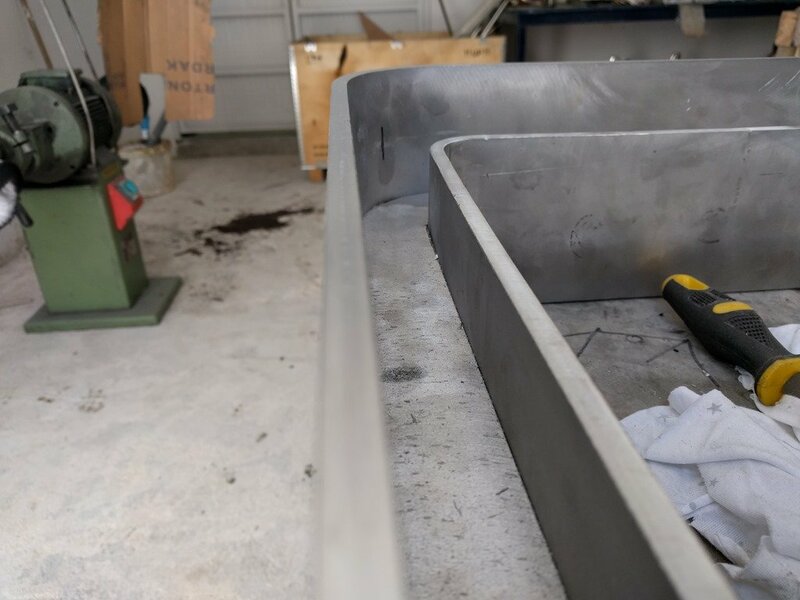 The one in the foreground is fully welded and ready to head to have the three edges machined and the hatch in the middle has the Gutter and Outer frames tacked in place ready for the Inner frame to be slid in place, tacked and then fully welded. 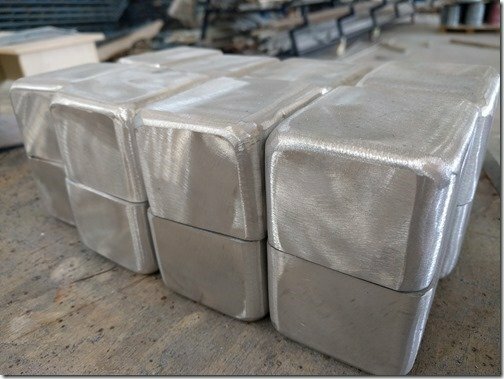 If you have not seen last week’s update post here is what the finished hatches will look like. 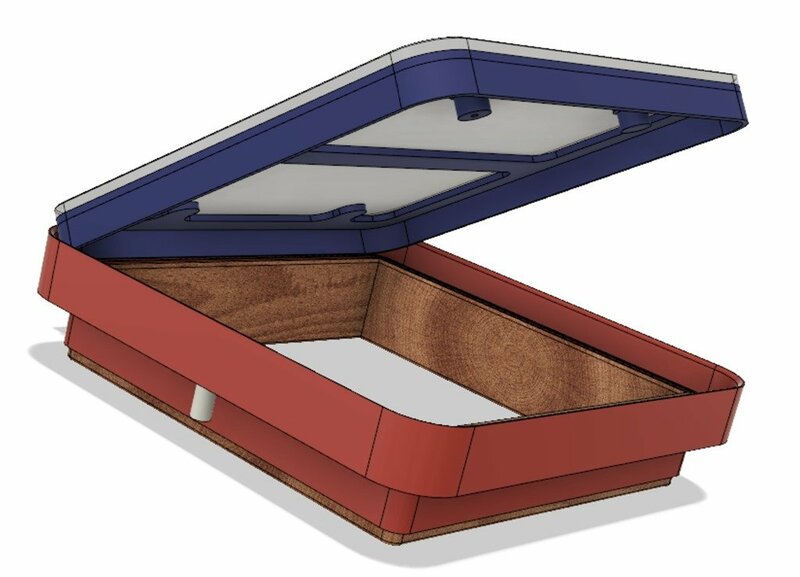 I’ve made the Deck plate transparent so you can see how the hatches fit flush with the deck and what lies below. 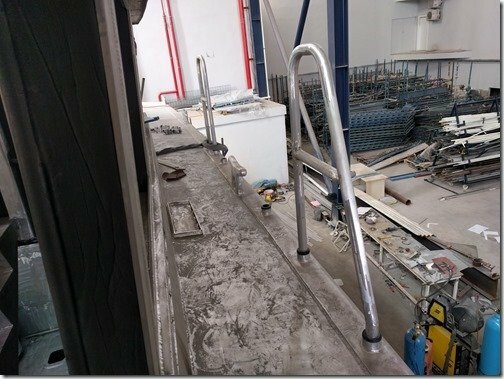 Note too the white pipe extending below the middle of Gutter frame. 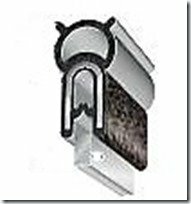 There is one 20mm / 3/4” ID drain pipe on each side to quickly remove any water that collects in the 40mm / 1.6” wide Gutters. 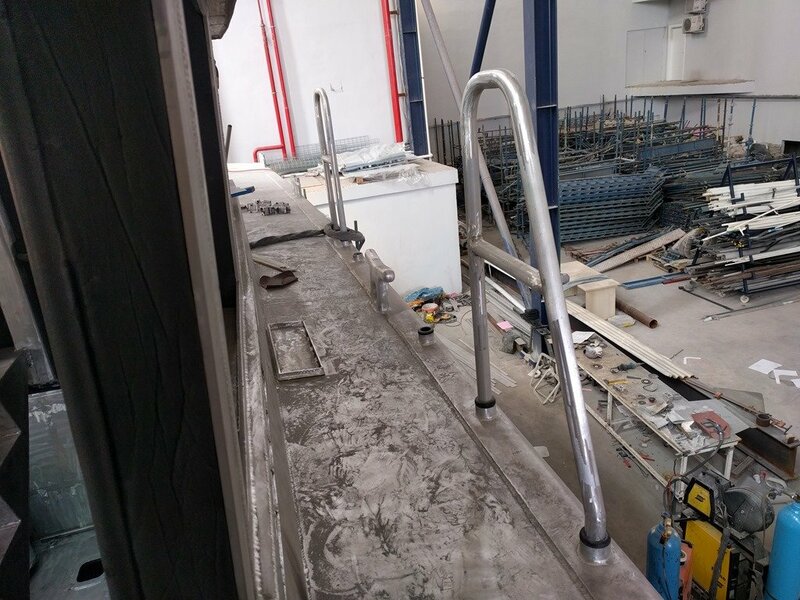 Not shown are the latch handles and SS gas compressed lift cylinders on each side. And this section view will show you how the Hatch Lid fits into the Frame with the thick solid wood liner on the inside extending down below the ceiling panels. 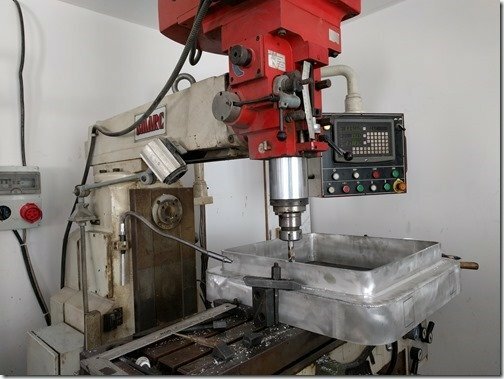 Once the Frames are fully welded together we put them on this vertical milling machine to level the edges which are critical for the watertight seals. 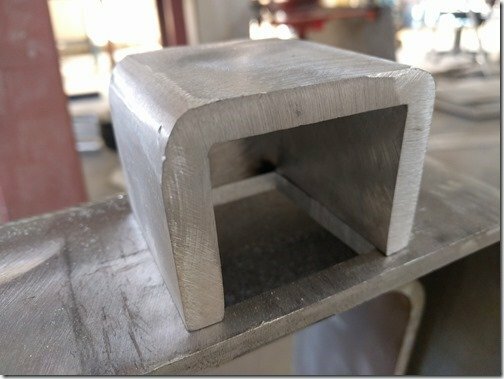 I sized the initial widths of the flat bar shapes to be CNC cut out of the 8mm thick AL plate to be 5mm larger than their finished size to give us enough material to do this leveling. The Hatch frame is clamped upside down to the table so the bottom edge of the inner frame can be cut first as it is not critical to the functioning of the hatches but gives us a good reference surface for milling the two upper edges which are critical. With this bottom surface all trued up the hatch is flipped right side up to cut the top edges of the Inner and Outer frames which are critical to the seals working properly. This close up shot shows the finished upper edges all nicely milled flat and true. As per the drawings below the Hatch seal fits overtop of the edge of the Inner frame you see here and so it is important that this surface is absolutely flat and on a plane parallel to the edge of the outer frame which is welded flush with the Deck plate. The bottom of the hatch seal has an upside down U shaped PVC bottom which will fit tightly overtop of the inner frame edge you see here and then there is a hollow 11mm / 1/2” EPDM rubber tube on top which is squeezed about 50% by the flat inner surfaces of the Lid when fully closed. 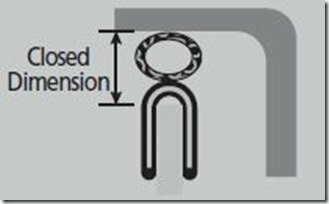 Similar to how the door seals on your car work. 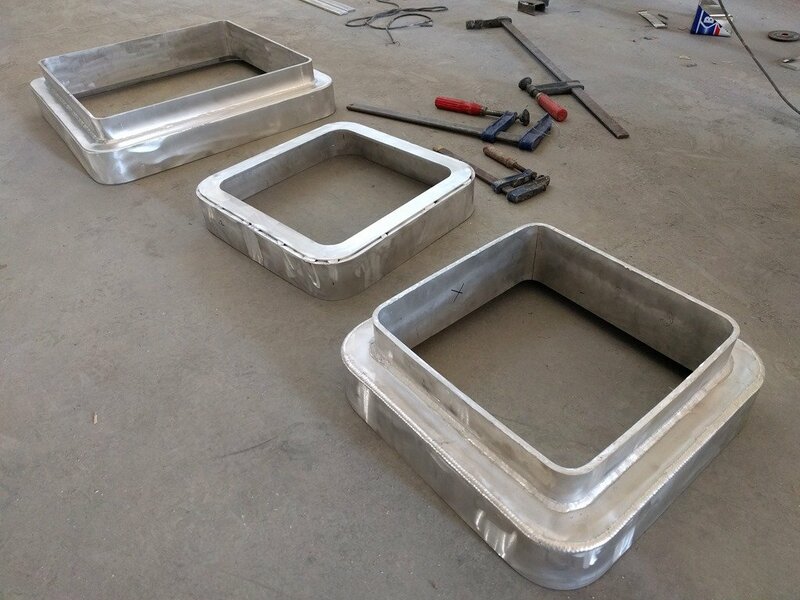 Next up are these Hidden Hinge Boxes which are welded to the outer frame and the underside of the Deck plate. I’ve made the 10mm thick aluminium they are made of to be transparent in this quick render so you can see the Hinge Arm and SS pin on the inside. 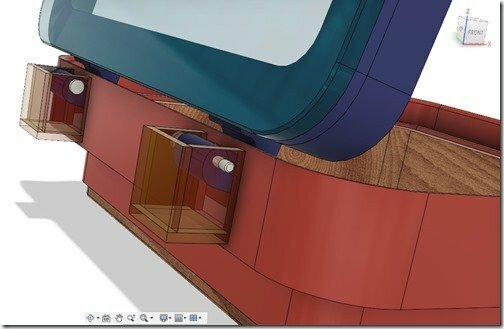 See the animation at the end of this post to see these Hidden Hinges in action. 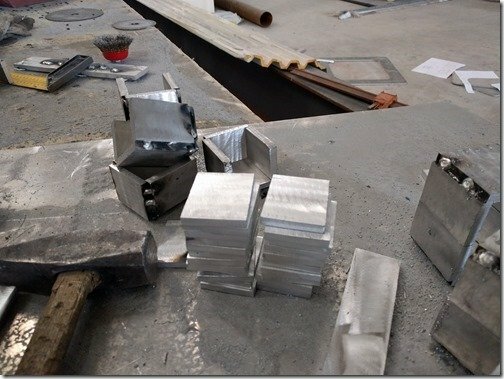 Rectangles of 8mm plate you can see stacked up in the front here are first cut and then tacked together. After being fully welded the Hinge Boxes are cleaned up and ready to be mounted later on after the Hatch Frames have been welded into the Deck. 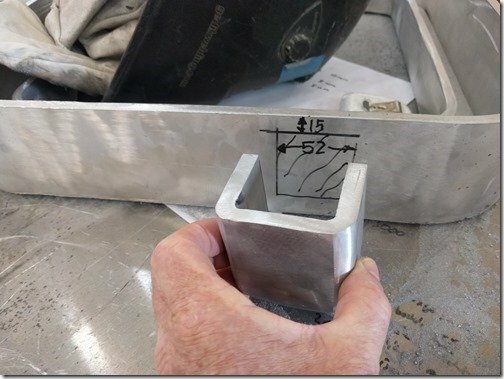 A rectangular hole needs to be cut into the Outer frame where the Hinge Arm will sit and I’ve roughly marked that out to show you here. 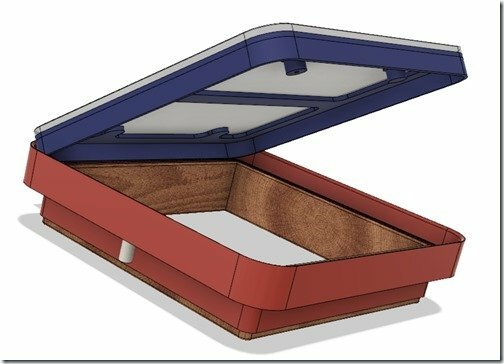 This small rectangle on top here will show you how the 6mm thick Deck plate sits flush with the top edge of the Outer frame and how the Hinge Box rests tight against the bottom of the Deck. 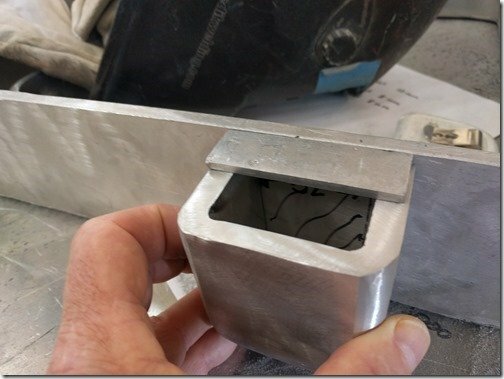 Both holes have been cut into this Frame and the Hinge Box is all ready to be welded in place. 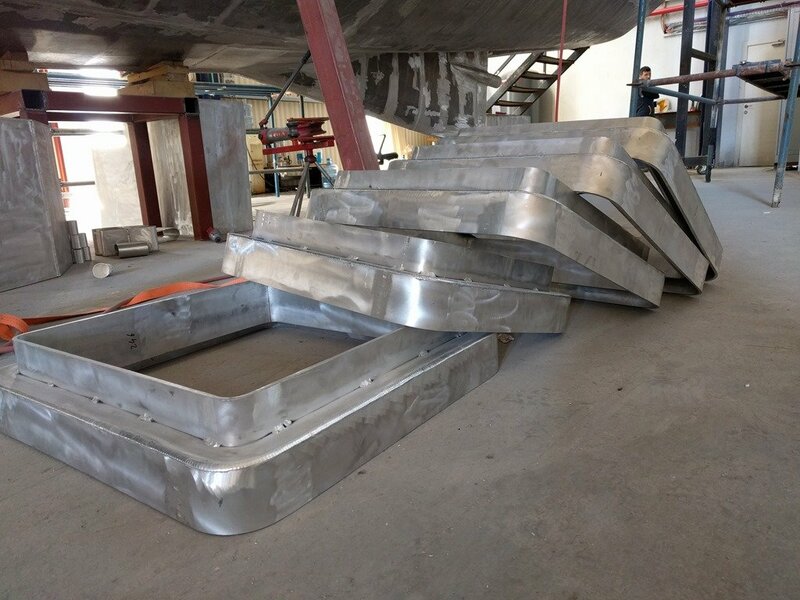 We will wait until the Hatch Frames are all welded into the Deck to fit and weld these Hatch Boxes in place so we can ensure they are in precisely the right orientation to line up for for the SS Hinge Pins. 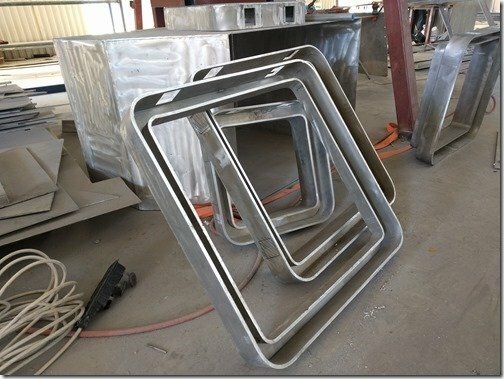 The Frames are all now ready to be fit and welded into their respective locations in the Deck. Or in the case of the first hatch to be fitted, into the overhead of the entranceway from the Swim Platform into the Workshop. 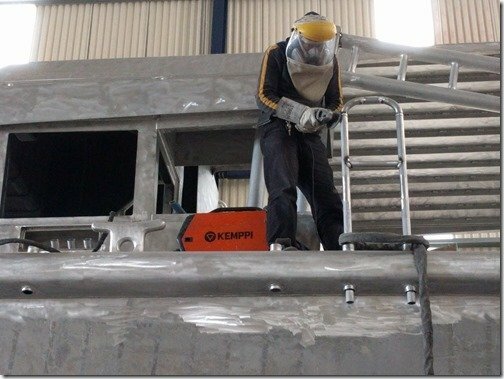 Moving up top onto the Aft Deck we see the other side of this entranceway with the hatch location marked out and if you click to enlarge this shot, as you can do to any picture in the blog, you will see that the side closest to you has already been cut with the jig saw blade that has been inserted in the right corner for clarity. 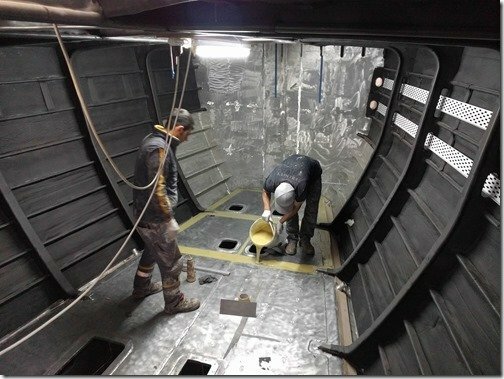 Next week we should see most of the ten hatches being installed like this in various locations in the Deck such as one here under the stairs on the aft Starboard (right) corner of the Pilot House/Galley which lead up to the SkyBridge. 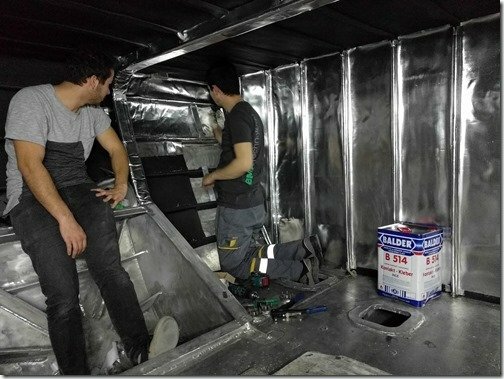 This is largest of 3 hatches which bring lots of natural light and fresh air into the Guest Cabin/Office below. 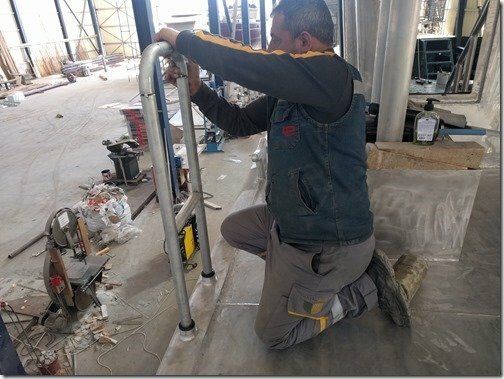 As per the title of this week’s post work also picked on with the mounting and welding of the many sets of Railings which are made from 40mm / 1.6” thick walled AL tubing. 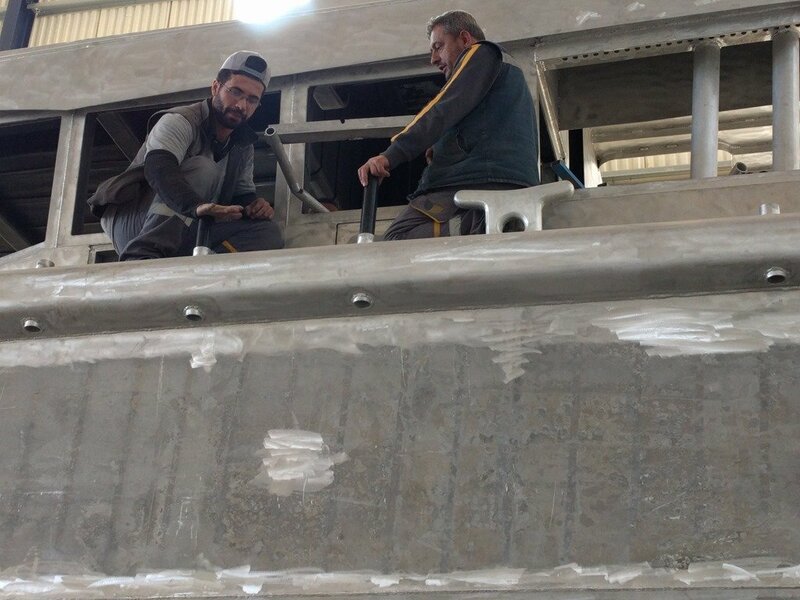 First Uğur and Sezgin fit the Delrin sleeves that have been machined to fit snugly into the AL pipe sockets for the bottoms of each Stanchion post and Railing leg. 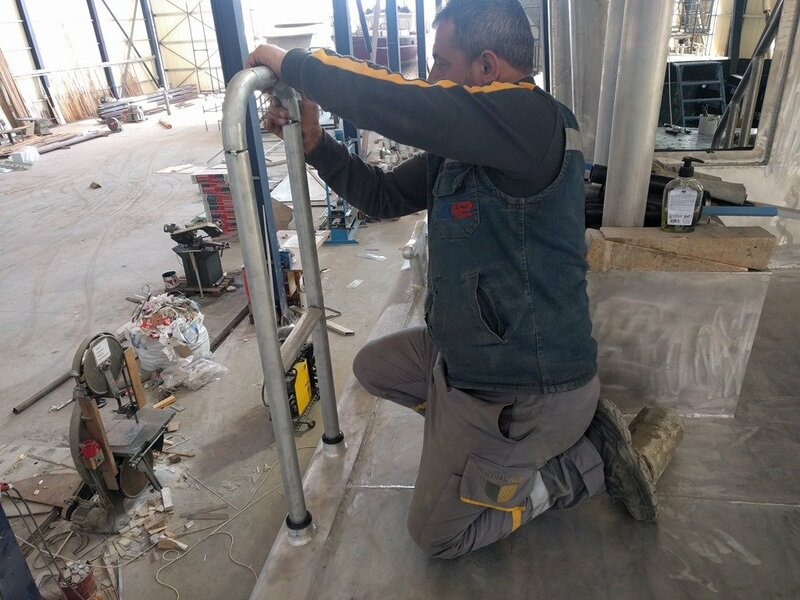 The 40mm pipe of each Railing or Stanchion post is also a snug fit into these black Delrin sleeves so it takes a bit of force for Sezgin to push these two legs of this Gate Railing into place. 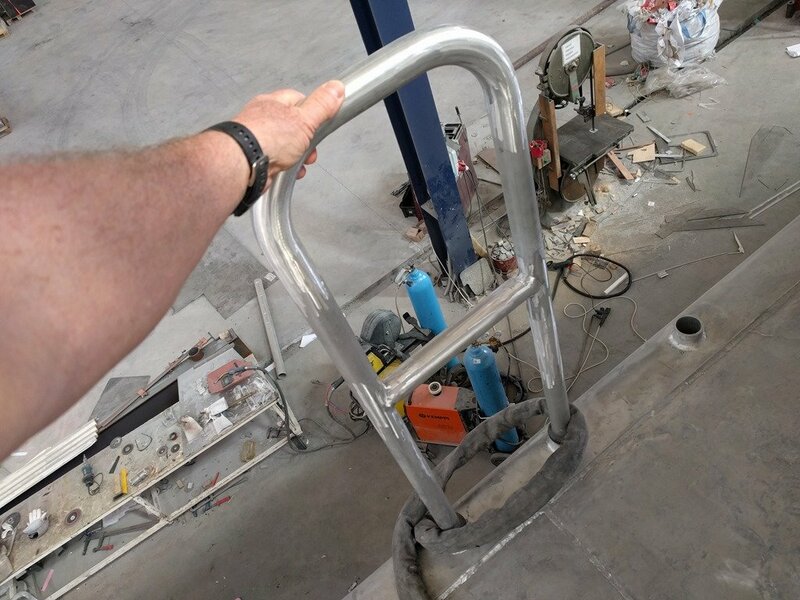 We’ve taken so much care to get such a close fit so the Railings won’t have any wobble when you grab or lean on them. One of my pet peeves! Once they are all positioned correctly and tacked together, each Railing is welded and cleaned up. 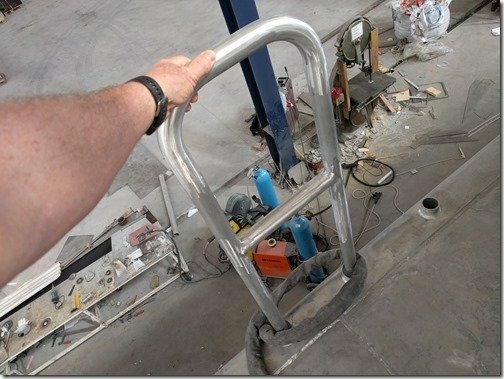 The top of these Railings and the Stanchion posts are 1m/40” above the Deck/Rub Rail which is much higher than most boats but just right for these XPM type of boats which will see some very Xtreme conditions as they Xplore the world. The big Paravane A-Frames will hinge on the Rub Rail forward of the Gate Rail above and be book ended by this tapered Railing on the other side. 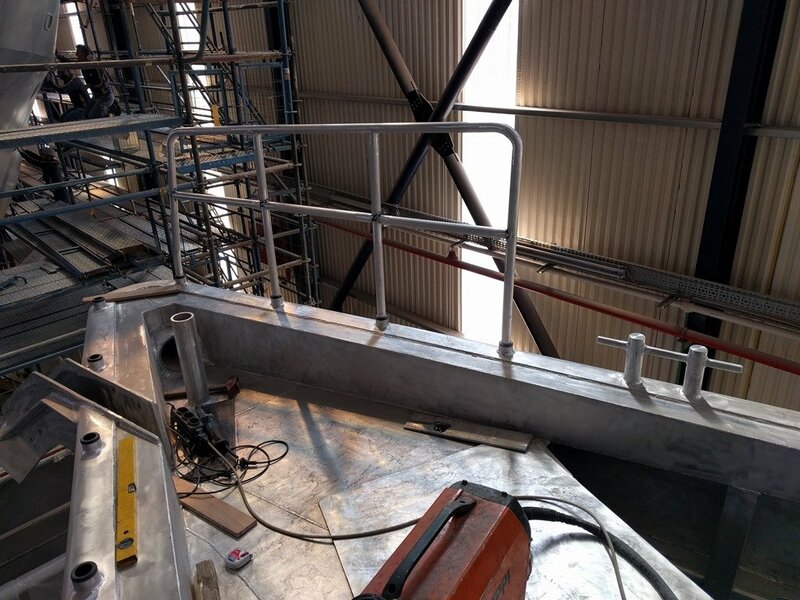 Three Grey Dyneema lifelines will run horizontally between all these Railings and the Stanchion posts making for a very safe and difficult for anyone to fall overboard with the possible exception of our little Yorkie Barney! 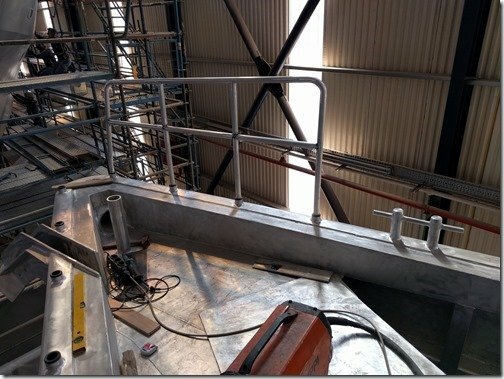 Up front at the Bow the large sloped Anchor Deck area is fenced in by these sturdy Railings which will raise the on deck safety factor of this critical area all the higher which makes us VERY happy. 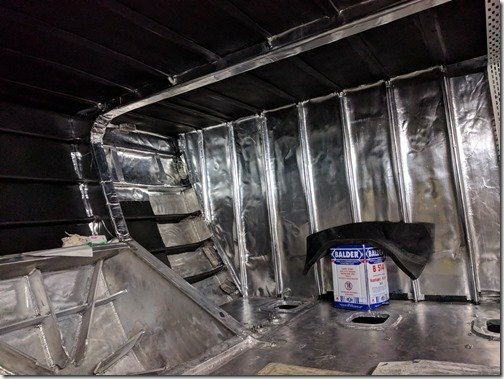 The seemingly never ending task of installing the nautical miles of EPDM foam insulation continued of course and Muammer or “Mummy” as he is mostly called, diligently keeps making more and more progress and never tires of it. 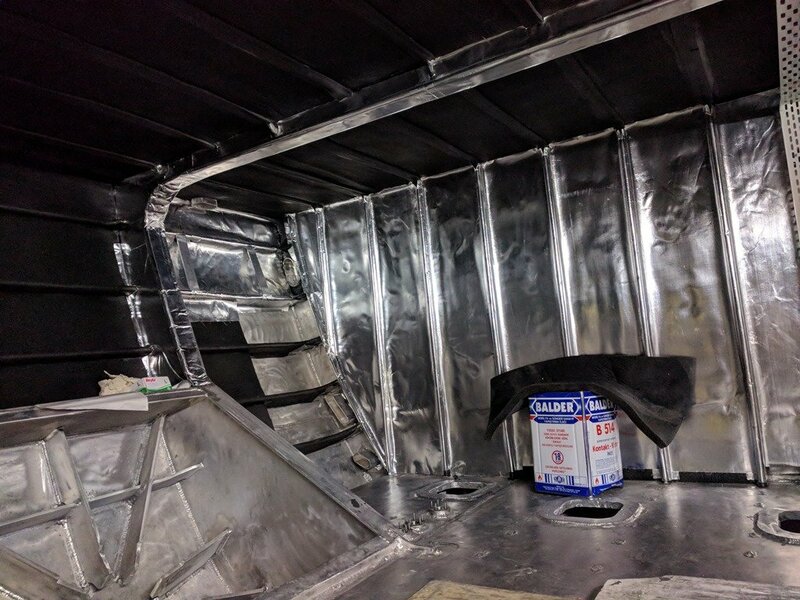 For a slight change of pace though, this week he has also been applying some of the thick foil covered cloth which is glued overtop of the EPDM in areas such as this in the Basement. 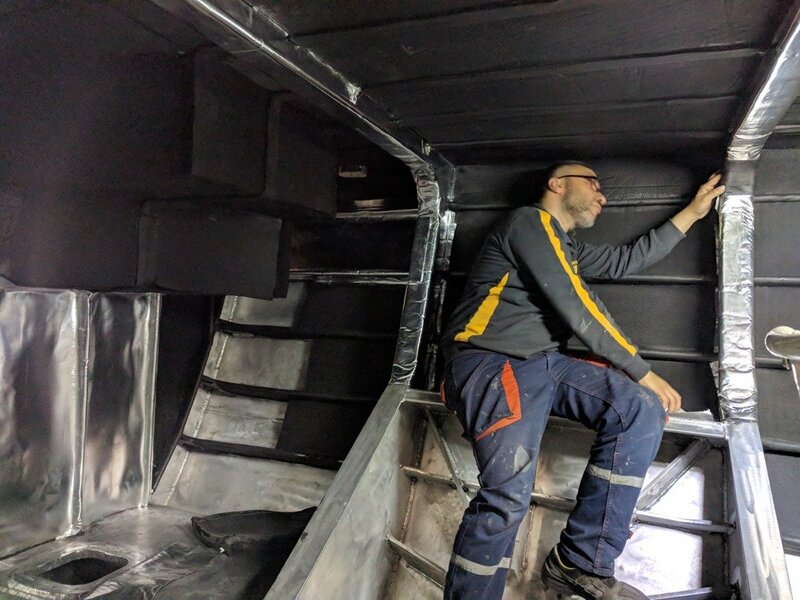 This specialised foil cloth is very thick and meets all the classification society requirements such as Lloyds and RENA which all the big superyachts are required to carry. 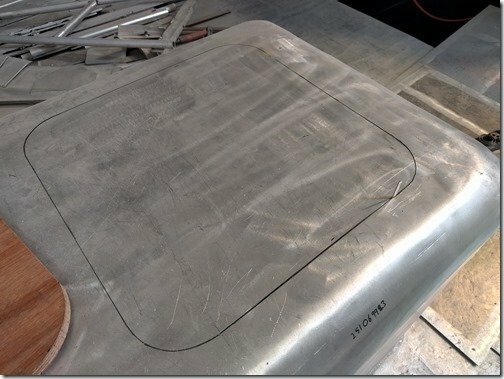 The foil has a thick fiberglass like cloth backing and is relatively easy to cut with sharp scissors and utility knives but it is very painstaking to fit it around all the complex shapes in these areas. 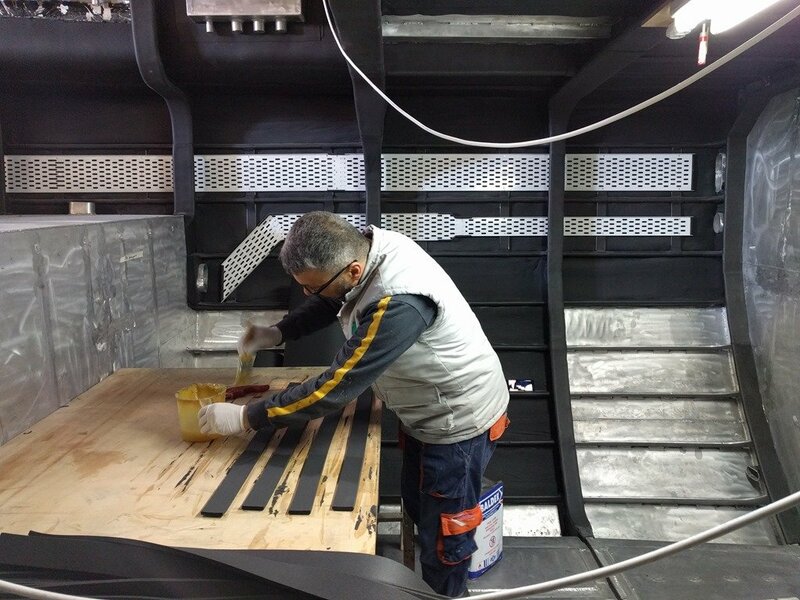 But it provides us with an Xtremely tough surface that will stand up to years of use, resists pretty much everything that might get on it, is easy to clean and creates a very easily light enclosed area such as in the Basement. This foil covered cloth is being installed in the Basement right now because of this exciting sign of progress. We are starting to mock up the locations of all the electrical devices and other equipment that will live down here. 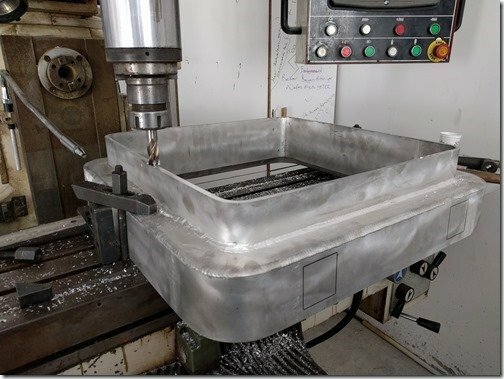 The foil needs to go in first so the many aluminium trays such as the white ones you see mocked up here can be more permanently mounted. These trays provide great support and easy mounting for all the electrical wiring, hoses and pipes that run throughout the boat. 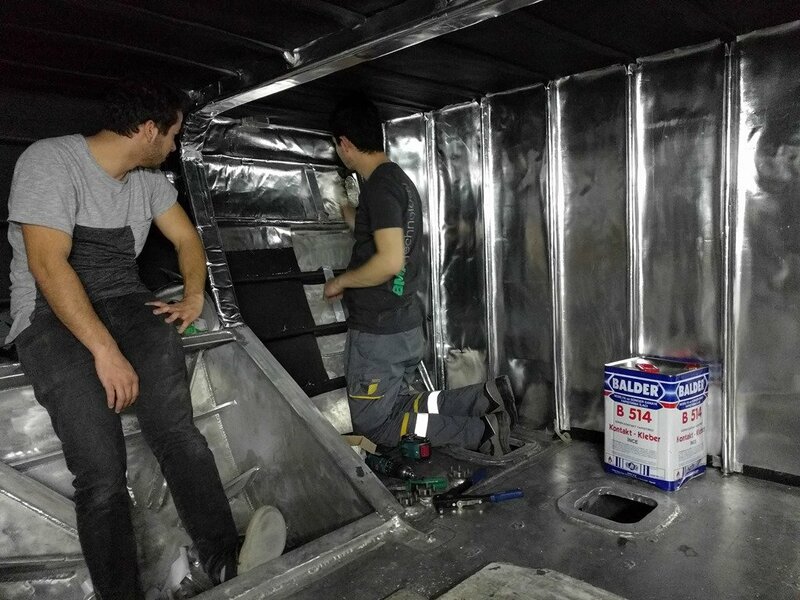 Yiğit on the left and Hilmi are working with me here to finalise the location in this particularly busy area where electrical lines, fuel hoses, plumbing runs and vent and fill lines all run through and need to stay out of each other’s way. 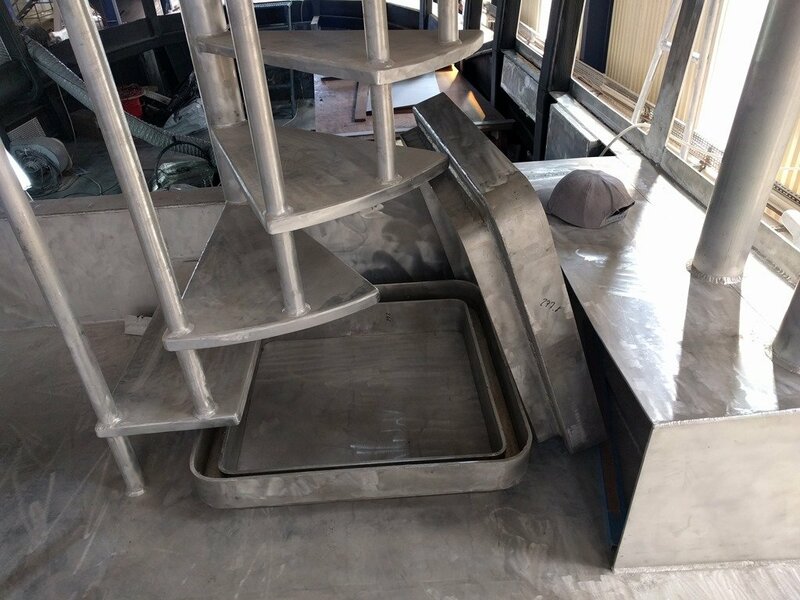 With locations all decided, Hilmi is now able to fit the AL flatbar which the trays are riveted to. One last bit of detail and excitement for us is the pouring in place of the thickened epoxy filler we are using to level and fill in the grooves and lower surfaces where the tank tops are welded to hull framing. 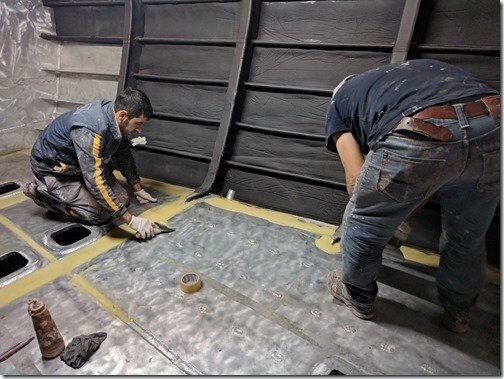 If you look along the outer edges by the hull sides (click to enlarge) you’ll see how they have temporarily glued some plywood to the angled margin plates that matches the height of the tank top surfaces and provides a stop and leveling surface as the trowel the epoxy level. We need to get these floor surfaces all flat and level prior to installing the 40mm thick Rigid XPS foam board that goes on top for both insulation and where the PEX tubing will be pressed in place for the in-floor heating that will be in all living area floors to keep us Xtremely comfy when we are in colder climates. 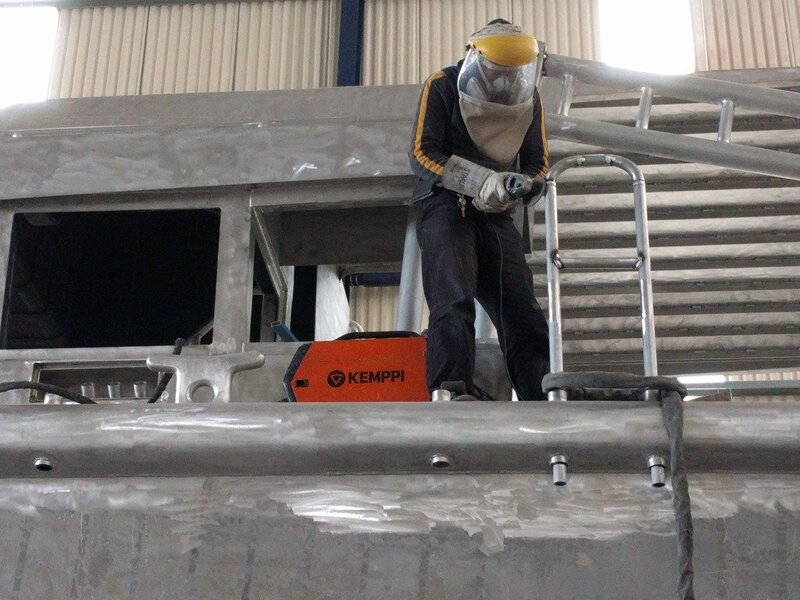 And that’s what’s been happening here with the build of XPM78-01 Möbius for the week of March 18-22, 2019. If you’d like to see this in video here is a quick sped up compilation of the few bits of video I was able to take this week. Hope you enjoy and let me know in the comment section below what you prefer format wise for these weekly updates between explanatory text and photos or video and how well each is or isn’t working for you. I’m always wanting to get as much feedback from you as possible on what’s working, what’s not and any suggestions for me to consider so thanks in advance for that. 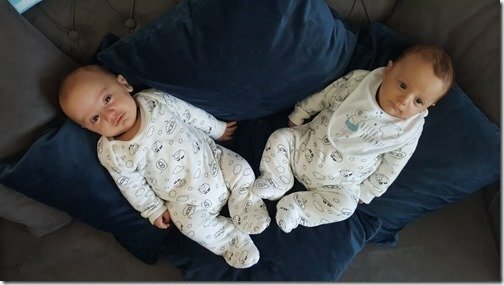 And saving the best for last as usual, here is this week’s dose of cuteness for all of you with this update shot of the infamous Dinc twins, Mert and Yiğit. Daddy Dincer sent this one to show them modeling some of the clothes we gave them for baby gifts. At the time (end of Dec) the boys were SO small that we thought they would take a long time to grow into them so it is amazing to see them sporting their new outfits already. Thanks for taking your valuable time to join us here and we look forward to getting any and all comments, questions and suggestions from you via the “Join the Discussion” box below. 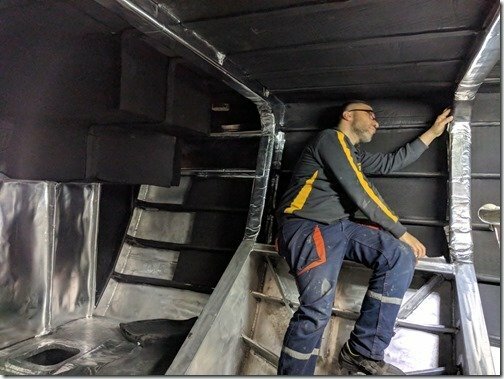 The second to last boat 🙂 photo seems to indicate that your tankage runs far forward. Is this the master stateroom in the forward half of the boat, or the fore-peak? Format-wise, I prefer the photo’s with explanatory text myself. Hi Carl. Our 14 tanks are roughly divided up with fuel in middle being “book ended” by water fore and aft. So the tanks in our Master Cabin, which is what you were seeing in that photo, is water tanks. 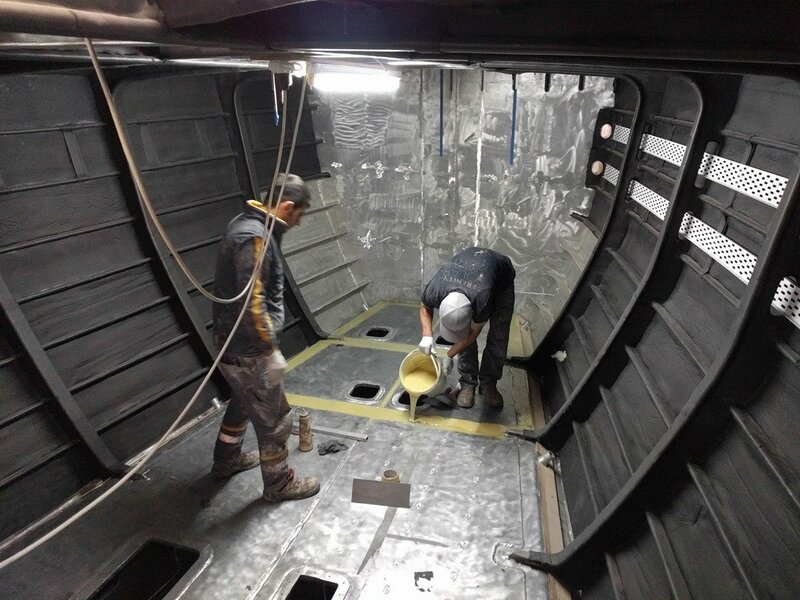 The water tanks end at that bulkhead you see in the photos that separates the Master Cabin from the Forepeak. Thanks for the feedback on format. I’m like you which is why I’ve been doing text/photos for the blog updates but I’m getting lots of requests for more video. Trouble is of course that most people say they want both, which is great except that I’m already “as busy a one armed wallpaper hanger” as my Dad used to say and video editing takes me a HUGE amount of time so it’s a challenge but I’m working on it.